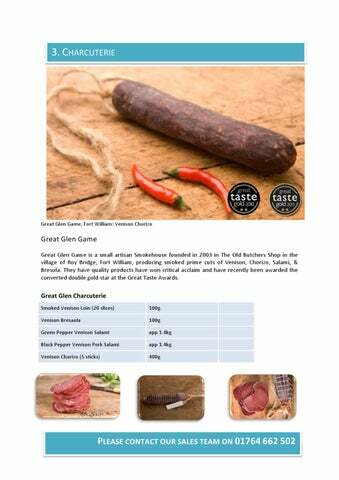 Great Glen Game Great Glen Game is a small artisan Smokehouse founded in 2003 in The Old Butchers Shop in the village of Roy Bridge, Fort William, producing smoked prime cuts of Venison, Chorizo, Salami, & Bresola. They have quality products have won critical acclaim and have recently been awarded the converted double gold star at the Great Taste Awards. Great Glen Game, Venison Charcuterie, Iberian Hams, Chorizo, Parma Ham, Sausages, Stornoway Black Pudding.